In this article, we focus on wellbeing as an important concept relating to bioenergy development in Canada. We use a three-dimensional or social approach to understanding wellbeing, which includes subjective and relational aspects in addition to the more traditional material dimension of wellbeing (e.g. financial resources, a healthy environment). Indigenous business leaders engaged in forestry, energy, and related resource sectors were recruited through our partner organization, the Canadian Council for Aboriginal Business, as a representative sample of key people to be engaged in the scoping of existing and future bioenergy partnerships in Canada. Participants often responded in ways that did not discretely fit into categories, but instead reflected a perspective on their own and their community’s dimensions of social wellbeing, which we captured through open coding for emergent themes. 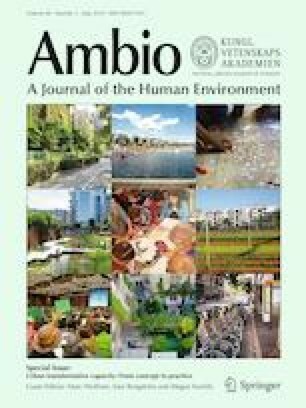 Our findings on material wellbeing illustrate that relationships between different wellbeing dimensions need to be considered for community-appropriate bioenergy development. The online version of this article ( https://doi.org/10.1007/s13280-019-01166-1) contains supplementary material, which is available to authorized users. This work was supported by the Social Sciences and Humanities Research Council (SSHRC) of Canada (#872-2016-1036), SSHRC Canada Research Chair in Human-Environmental Interactions (950-231641), and BiofuelNet Canada (#SO-3-Bullock). In-kind support was provided by the Canadian Council for Aboriginal Business. The authors thank the study participants for sharing their knowledge. Thanks also to our capable research assistants, Shannon Ganter and Miranda Hamilton. Any errors or omissions are our own. Aboriginal Affairs and Northern Development Canada (AANDC). 2018. Land Management. Retrieved from https://www.aadnc-aandc.gc.ca/eng/1100100034737/1100100034738. BC Energy Network. n.d. Capacity building. Retrieved from http://bcbioenergy.ca/what-we-do/capacity-building/. Accessed 2 May 2018. Council of the Federation. 2015. Canadian Energy Strategy. https://www.gov.mb.ca/jec/energy/pubs/canadian_energy_strategy.pdf. Natural Resources Canada (NRCan). 2012. Evaluation of the Sustainable Bioenergy Strategic Priority. Retrieved from http://www.nrcan.gc.ca/evaluation/reports/2012/798. Accessed 12 Sept 2017. Natural Resources Canada (NRCan). 2018a. Bioenergy systems. Retrieved from http://www.nrcan.gc.ca/energy/renewable-electricity/bioenergy-systems/7311. Accessed 2 May 2018. Natural Resources Canada (NRCan). 2018b. How does the forest industry contribute to the economy? Retrieved from http://www.nrcan.gc.ca/forests/report/economy/16517. Accessed 2 May 2018. Natural Resources Canada (NRCan). 2018c. Bioenergy from biomass. Retrieved from http://www.nrcan.gc.ca/forests/industry/bioproducts/13323. Accessed 2 May 2018. Natural Resources Canada (NRCan). n.d. Solid biofuels bulletin No. 1. Accessed May 2, 2018, from https://www.nrcan.gc.ca/sites/www.nrcan.gc.ca/files/NRCAN_BB_no1_e_accessible.pdf.